A pair of dress shoes is essential in any man's wardrobe. While they may not seem relevant to your daily wear, eventually you will need a pair--either for work, a wedding, or some other special occasion. If you only own one pair, versatility will be the most important factor. A plain black or brown derby with a rounded toe fits this bill. Thrift stores--often unreliable for much else--consistently carry dress shoes (some of them very good) for those unwilling to shell out for a new pair. Consider durability and comfort when purchasing, as they might last you for years. The two most common styles of men's dress shoes, the Balmoral and Derby are distinguished by their "lacing type," or how the eyelet tabs are stitched in relation to the vamp. Balmorals (also informally called Oxfords) feature a "closed lacing" style in which the eyelet tabs are stitched underneath the vamp. 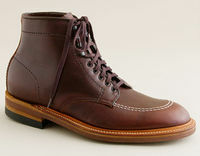 Derbies (also called Bluchers) feature an "open lacing" style in which the eyelet tabs are stitched on top of the vamp. Simply put, the section that holds the eyelets is "on top" on a Derby and "tucked under" on a Balmoral (see picture for details). In general, Derbies are considered more casual than Balmorals. Also note that while Balmorals may be called "Oxfords", both Derbies and Balmorals are types of oxfords. An oxford is simply any form of laced shoe. This is why certain sneakers may be referred to as oxfords, such as Converse's Core Ox and Sperry's Striper CVO (which stands for Circular Vamp Oxford). Low cut shoes with no or largely nonfunctional laces and typically a moc toe construction. Generally considered more casual than a laced shoe. An ankle length boot with two or three pairs of eyelets. Worn casually, desert boots are a popular style of chukka. 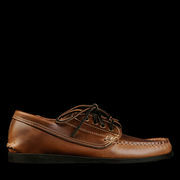 Generally any suede derby, these shoes were originally made of Brazilian or Chinese deer skin and worn as sport shoes. May be made with suede or nubuck and may feature a brick red sole. Nubuck will tend to make for a more expensive shoe and has a finer, velvety nap. A style of laceless shoe closed with one or two straps and buckles. A monk shoe with two straps may be refered to as a "double monk." Any shoe or boot with broguing--small decorative perforations, often along with serrations along the visible edges (e.g. along the throat line, toe cap, and tongue). A shoe can simultaneously be a balmoral(or derby) and a pair of "brogues". Due to the functional purpose of broguing, brogues were originally considered a casual shoe, but this is no longer true. Brogueing can be found on both casual and formal shoes. Additionally, there are different terms for the extent and style of broguing: the popular full brogue (or wingtip), semi-brogue, quarter brogue, as well as the longwing style. A shoe with an extra layer of material covering the toe of the shoe. There are different styles of toe caps, but generally when a shoe is refered to as "cap toed" it will be a simple cap like the one shown below. A toe cap can be found on any type of shoe from dress shoes, to boots, and even sneakers. Short for moccasin toe, a construction wherein visible seams run along the toe box of a shoe. This owes to the simple construction technique where a 'plug' (the top section of the vamp on a loafer) is sewn to the vamp. Similar to a moc toe, an apron toe is stitching along the toe of the shoe. However, an apron toe is (or simulates) an apron stitched onto the vamp. This usually looks less rough than a moc toe, and results in a shape closer to a plain toe. An example of oxford shoes with full broguing (aka wingtips). A shoe with a capped toe. Many dress shoes come from the factory laced in such a way that they look nice, but aren't that easy to unlace. 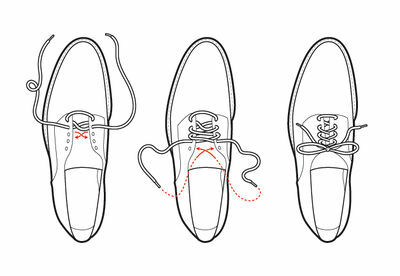 Here's a diagram for lacing (which will work as well for sneakers and other shoes) in addition to a very quick and efficient form of tying shoe laces called the Ian Knot. The Ian Knot. Here's the method on youtube. This page was last modified on 6 May 2018, at 11:52. This page has been accessed 277,676 times.